A couple weeks ago I received a fat eighth bundle of Oakshott Cottons to play with from Michael Oakshott. I'm going to guess that many of you have maybe seen some of these fabrics around in blogland but haven't had a chance to work with them yet. That was the case for me at least. 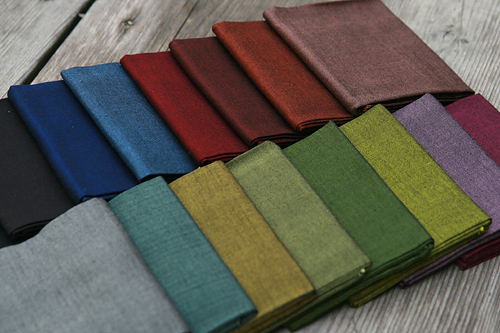 Oakshott Cottons is a family run British business which ethically manufacturers their fabrics in India. They have a photo story on their website that was really fascinating for me. I highly encourage you to check it out! I sort of assumed Oakshott cottons were similar to the Kaffe Fasset shot cottons or Moda Crossweaves. This is partially true - however these have proven so much easier to work with from a quilter's point of view. While the others seemed to slide and stretch a lot, these just seem much sturdier when piecing. And that's in a good way. This color bundle is Lipari - Fat 8ths Pack. 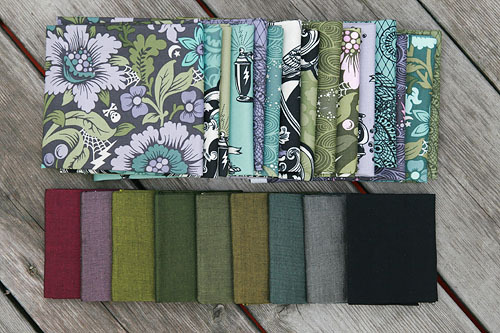 This bundle has been shot with black to create beautiful jewel tones. I decided to pair some of the fabrics with Tula Pink's Nightshade fabric for Halloween. I'm actually not sure I will get this quilt done for Halloween (this year) - I've been so busy prepping for the Sewing Summit! But I have started cutting. 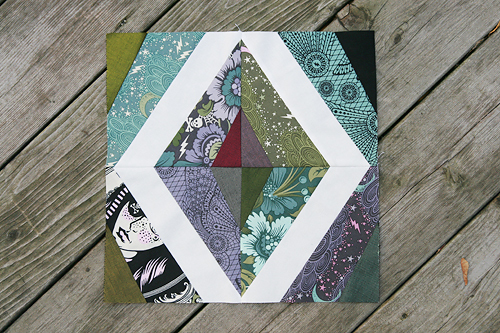 I'm using my Prism quilt pattern, but I decreased the block size down to 6". 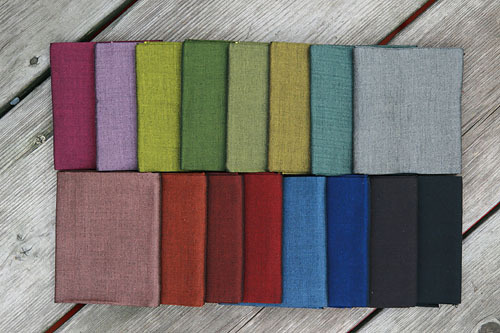 I've had a lot of people ask me on Flickr and Instagram where they can get these fabrics. Oakshott does deliver to the US via FedEx from their website. Of course international shipping can be pricey. It might be a good idea to pair up with a couple friends and place and order and have them all shipped together. Happy sewing everyone!